Only two gold bracelets remain to be awarded at the 2017 World Series of Poker at the King's Casino in Rozvadov after Albert Hoekendijk emerged victorious in Event #8: €1,111 Little One for One Drop No-Limit Hold'em, defeating Thomas Hofmann after a hard-fought heads-up duel of almost three hours. Hofmann would have been only the second player from Switzerland to lift the coveted bracelet for a winner shot, but instead if was Hoekendijk who walked away with the first-place payout of €170,764. Before the final day of the €1,111 Little One for One Drop and Day 2 of Event #10: €111,111 High Roller for One Drop got underway, the 1 Million buyin BIG ONE FOR ONE DROP was confirmed to return in 2018 in Las Vegas, starting July 15, and King's Casino owner Leon Tsoukernik was the first player to put down his deposit to become the 1st official entrant for the event. 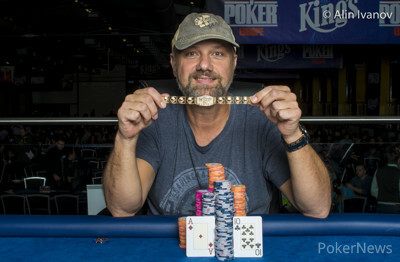 Hoekendijk became the fifth WSOP bracelet winner in Dutch poker history, after Rob Hollink, Marc Naalden, Marcel Vonk and Vincent van der Fluit. "All old geezers, including me," Hoekendijk said with a thunderous laugh. About the length of the heads-up, which clocked in at nearly three hours, Hoekendijk said. "Now I feel happy. He started the heads-up with a chip lead and I was tired. But more and more, I got the feeling that I wanted to win it. We had a nice heads-up and I'm very happy with the result." "I had no hands, for two hours! interfered Hofmann, who was listening as Hoekendijk was being interviewed. Both shared a laugh about it. "It was very nice. I was glad I was heads-up with him." Key hand at the final table was Hand #77 in which Hoekendijk called start-of-the-day chipleader Abdelhakim Zoufri with just a pair of aces on an ace-queen-queen-king-ten board. Hoekendijk moved up to second place after the hand, while Zoufri was never able to recover and eventually bowed out in fourth place. Asked about the call, Hoekendijk said: "I had the ace in the big blind and I just called his raise. I figured he didn't suspect me to have an ace. And.. well, to be honest, it just felt right. Maybe it's not the best call in the world, but it felt right at the time." When asked about the money and the bracelet, Hoekendijk's smile widened. "The money is nice, because I can just play now. I love to play tournaments, especially the Main Events. And when I wake up tomorrow, and I see that bracelet, I know they'll never take it from me. A great feeling!" Hoekendijk ended the interview with specifically thanking King's Casino in Rozvadov. "I want to especially thank the organization here. It's very good." Hoekendijk said. "It's a very well organized tournament and I really like it here." The Dutchman and runner-up Hofmann exchanged plenty of banter at the tables and it was yet another close call for the Swiss, who already finished 17th in THE COLOSSUS a few days ago. Hofmann, who works in telecommunication back home in Zurich, has visited the King's Casino for the fourth time and previously won a non-ring Side Event of the WSOP International Circuit in Europe's biggest poker arena. "If I cash for at least €20,000, I told myself to play in the Main Event," Hofmann added and will join the action for Day 1b on Sunday November 5th 2017. Throughout the two starting days, the event drew a total of 868 entries and prize pool of €866,654, which was split among the top 131 spots. The money bubble burst early on Day 2 and among those to cash but fail to make it to the final day were Allen Kessler (118th, for €1,660), Roland Israelashvili (112th, for €1,660), Besim Hot (99th, for €1,738), Mike Leah (98th, for €1,738), Paul Michaelis (85th, for €1,855), Marcel Luske (81st, for €2,016), Barny Boatman (77th, for €2,016), William Kassouf (75th, for €2,016), Maria Lampropulos (68th, for €2,231), Sebastian Langrock (64th, for €2,231), Michael Eiler (42nd, for €3,362), David Urban (23rd, for €4,812) and Willem de Jong (15th, for €7,351). Only 11 hopefuls returned in the hopes of joining the WSOP champion's club and it was Stanislav Koleno who missed out on the unofficial final table. 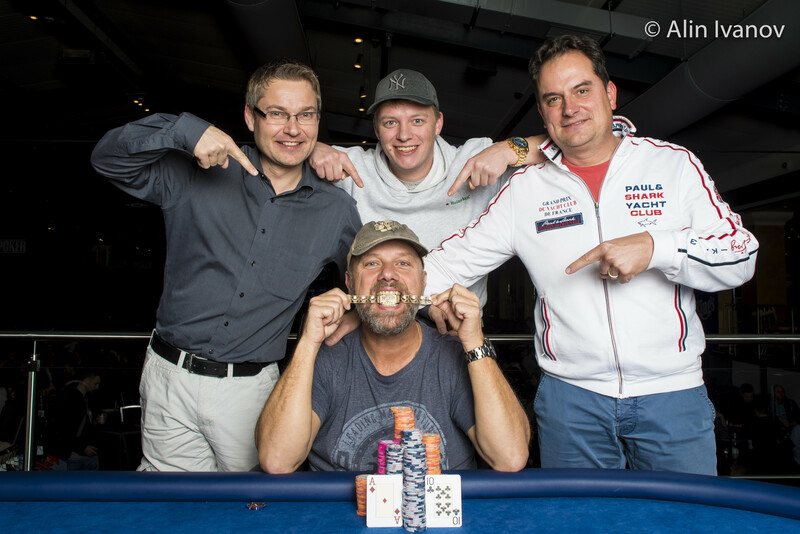 After just having doubled up his short stack, the Slovakian three-bet shoved with ace-ten into the pocket kings of Albert Hoekendijk and had to settle for €9,306. Vlado Banicevic also fell to the Dutchman when his jack-ten suited was no good against Hoekendijk's ace-king and that vaulted the Dutchman into a top three stack. Hoekendijk was also involved in the third casualty of the day and knocked out Przemyslaw Klejnowski in 9th place in a three-way pot with king-queen versus pocket fives and the ace-king of Oleh Haisiuk. Artan Dedusha started the final day among the chip leaders but lost most of his stack against a straight. Right after the Brit moved all in with queen-jack and Johannes Toebbe isolated successfully with ace-king, then dodged the two live cards and straight draw of Dedusha. After the very next hand there were only six players left as Serghei Lisiy stood no chance with ace-eight versus ace-king. The other two short stacks would bow out in quick succession as Jonas Lauck with seven-six suited against the pocket deuces of Thomas Hofmann and Oleh Haisiuk with ace-five against the pocket sevens of Johannes Toebbe failed to improve. Four-handed play lasted for quite some time and start-of-the-day chip leader Abdelhakim Zoufri was left short after the aforementioned failed bluff attempt against Hoekendijk. He eventually got it in with ace-three versus pocket tens and Hofmann turned a full house to leave Zoufri drawing dead. Only three hands later it was all over for Johannes Toebbe. The German came back from a break as far shortest stack and three-bet shoved with ace-three. Hoekendijk called with king-jack suited and spiked a king on the flop right away. Only 99 hands were played on the final table by then, and the battle for the title lasted more than 130 hands thereafter. Ultimately Hofmann was grinded down to ten big blinds, doubled twice before shoving with queen-three into the ace-ten of Hoekendijk. An ace on the flop gave the Dutchman the lock on the hand and Hofmann was officially eliminated after a blank on the turn. The PokerNews live reporting team will continue to provide all the action from Rozvadov until a WSOP Europe Main Event champion is crowned on Friday November 10th 2017. Hand #232: Thomas Hofmann moved all in from the button for around 2.6 million and Albert Hoekendijk snap-called. The board ran out and Hofmann was eventually eliminated in 2nd place for a payday of €105,532, while Hoekendijk became the 5th Dutchman to win a WSOP bracelet. He takes home €170,764 for his efforts and a recap of today's action is to follow. Hand #229: Albert Hoekendijk moved all in from the button and Thomas Hofmann called for just shy of 10 big blinds. The board of improved both players on each straight and Hofmann eventually doubled for 1,470,000 with a straight. "How can I break this guy? Unbelievable," Hoekendijk added. Hand #230: Hofmann raised to 400,000 and Hoekendijk called. The flop was checked. On the turn, Hoekendijk bet 400,000 and Hofmann folded. Hand #231: Hofmann received a walk. Hand #221: Thomas Hofmann raised to 350,000 and Albert Hoekendijk called. Hoekendijk check-called 375,000 on the flop. On the turn, Hoekendijk checked, Hofmann bet 575,000, Hoekendijk moved all in and Hofmann folded directly. Hand #222: Hoekendijk shoved and Hofmann folded. Hand #223: Hofmann shoved and Hoekendijk folded. Hand #224: Hofmann got a walk. Hand #225: Hoekendijk got a walk. Hand #226: Hofmann got a walk. Hand #227: Hoekendijk got a walk. Hand #228: Hoekendijk shoved and Hofmann folded. 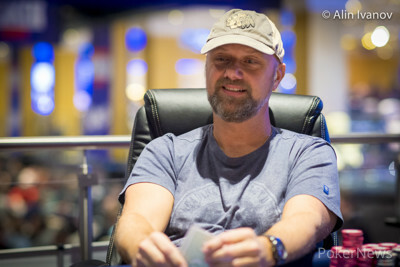 Hand #215: Thomas Hofmann moved all in and Albert Hoekendijk mucked the . Hand #216: Hofmann received a walk. Hand #217: Hoekendijk received a walk and showed . Hand #218: Another walk for Hofmann. Hand #219: Hofmann moved all in and Hoekendijk asked for a count, then called when it was deemed to be for 1,545,000 with the words "well let's gamble." The board came and Hofmann doubled. Hand #220: Hoekendijk raised to 430,000 and forced a fold. Hand #209: Albert Hoekendijk got a walk. Hand #210: Hoedendijk limped and Thomas Hofmann checked. Both players checked the flop. Hofmann bet the turn and won the hand. Hand #211: Hoedendijk got a walk. Hand #212: Hofmann got a walk. Hand #213: Hoekendijk got a walk. Hand #214: Hoekendijk limped in and Hofmann checked. Hofmann bet 300,000 on the flop and Hoekendijk called. On the turn, Hofmann checked, Hoekendijk bet enough to put Hofmann all in, and the Swiss folded. Hand #203: Albert Hoekendijk raised to 400,000 and Thomas Hofmann called. On the flop, Hofmann checked and called to a bet of 400,000. Hand #204: Hofmann raised to 400,000 and Hoekendijk moved all in, forcing a fold in quick succession. Hand #205: Hoekendijk raised to 400,000 and Hofmann defended the big blind. The flop fell and Hofmann checked, then folded to a bet of 650,000. Hoekendijk flashed the . Hand #206: Hofmann's raise to 380,000 was called by Hoekendijk. The duo checked down the board of and Hofmann showed , Hoekendijk chopped with and the Swiss sighed. "How do I get nine high all the time?" Hand #207: Hoekendijk moved all in and Hofmann mucked the . Hand #208: Hofmann raised to 380,000 and Hoekendijk called. There was no betting action on the board of and Hoekendijk won the pot with . Hand #197: Thomas Hofmann raised to 400,000, Albert Hoekendijk three-bet to 1,260,000 and Hofmann folded. Hand #198: Hoekendijk limped in and bet 300,000 on an flop. Hofmann called but check-folded to a 500,000 bet on the turn. Hand #199: Hofmann limped in, Hoekendijk bumped it to 560,000 and Hofmann gave it up. Hand #200: Hoekendijk raised to 400,000 and Hofmann called. Hoekendijk continued on an flop and took down the hand. Hand #201: Hofmann raised to 400,000 and got called. On a board, it got checked. Hofmann had and Hoekendijk won with . 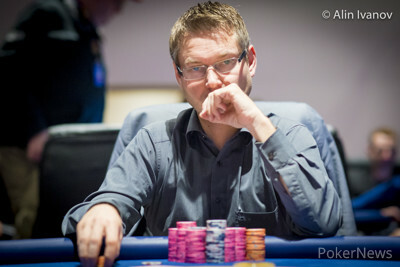 Hand #188: Albert Hoekendijk raised to 400,000 and showed after the fold of Thomas Hofmann. Hand #190: Hoekendijk raised to 400,000 and Hofmann called. The Swiss check-folded the flop to a bet of 700,000. Hand #191: A walk for Hoekendijk. Hand #192: Hoekendijk limped in and Hofmann checked. On the flop, Hofmann check-called a bet of 200,000 and did so again for 300,000 on the turn. The river was checked and Hoekendijk said "show me your six," which Hofmann did with . Hoekendijk had that beat with and raked in the pot. Hand #193: Hofmann's raise to 400,000 was met by a three-bet to 1.3 million by Hoekendijk and that ended the hand. Hand #194: Hoekendijk limped in. The flop came and both players checked. After the turn, Hofmann bet 200,000 and won the pot. Hand #195: Hofmann raised to 400,000 and showed . Hand #196: Hoekendijk limped in and Hofmann raised to 475,000. Hoekendijk reraised to 1,260,000 and Hofmann reluctantly folded, he was shown the by the Dutchman. Eleven Remain in Little One For One Drop, Who Will Capture A Gold WSOP Bracelet?